The climax of Sterts Theatre’s project to promote and encourage new playwriting talent in the local area and beyond. Simon Parker, playwright and writer lead a panel of enthusiastic and experienced judges in selecting the three best entries. 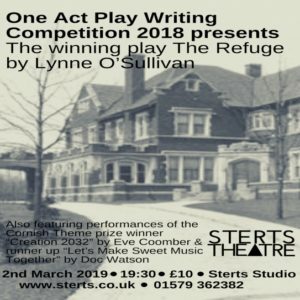 The author of the first of these will see a fully staged performance of their play, before an audience in Sterts studio, and the two runners-up will see rehearsed readings of their pieces on the same evening. There is also a prize for the best play on a Cornish theme.